Okay, this technically is NOT the first picture of my recent fall color trip on Thursday. It was the first photo that I processed and posted here. I got up at midnight Thursday morning and left the house around 1am for Convict Lake. 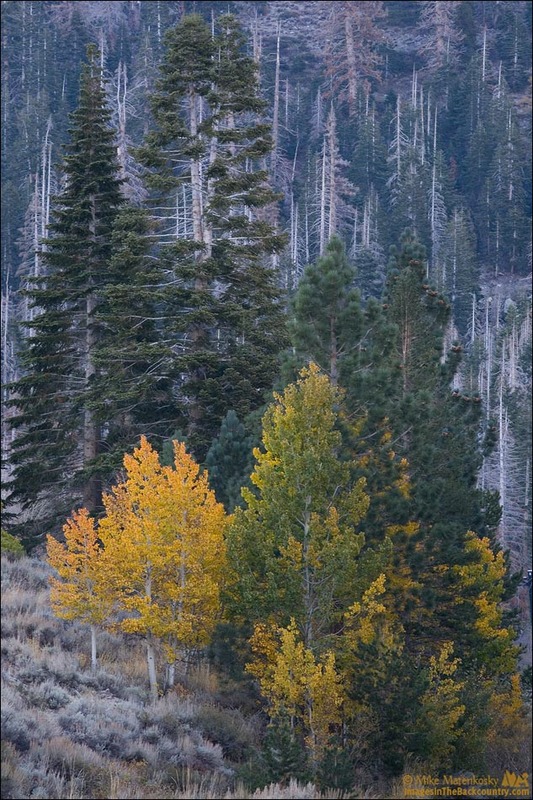 After shooting sunrise I headed over to the June Lake Loop where I shot this. After that I went up to Conway Summit and then down to Lundy Canyon. I heard that the beaver dam was damaged and there was little water but I went anyway. Should have skipped it as driving our new-to-us van got close to some branches and scratched the paint. It will rub out though. After leaving Lundy It was around 3pm. Still frustrated about the dam and the van I almost left for home. I would have kicked myself later so I went back through the June Lake loop and down to Convict Lake again. Decided to try and get some shots along Tioga Pass so I headed for home making one more drive through the June Lake Loop. Got home around 9:30pm and drove a little over 500 miles. I was in bed by 10pm.